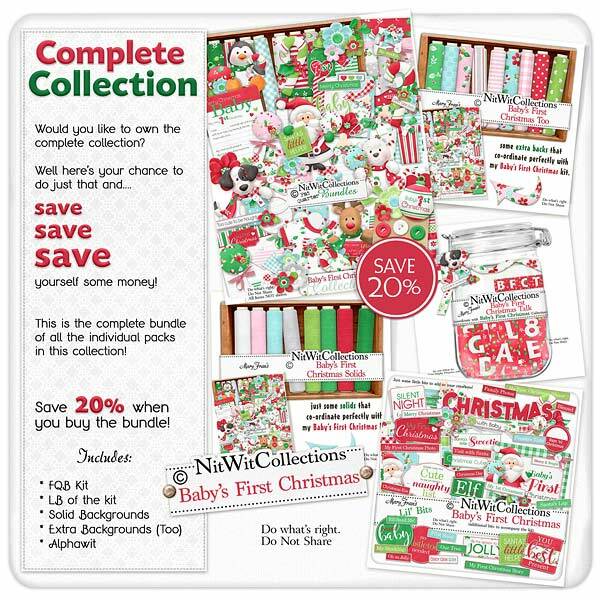 "Baby's First Christmas" Collection lets you create wonderful memories of your child or grandchild's first Christmas Season! Pictures on your cell phone?? Let's not lose those precious pics people....it is now time to download and create with them!! This festive baby themed Christmas kit will definitely fit the bill for a mini album, full memory album or special Christmas card for this honored First Christmas. Sweet elements from a Santa, puppy, penguin and bear with Christmas accents to traditional presents, a stocking and so much more will inspire you to create a genuine first Christmas project to be remembered. We wish that your baby's first Christmas is everything you hoped!